The city and all that is in it are to be devoted to the LORD. Only Rahab the prostitute and all who are with her in her house shall be spared, because she hid the spies we sent. But keep away from the devoted things, so that you will not bring about your own destruction by taking any of them. Otherwise you will make the camp of Israel liable to destruction and bring trouble on it. All the silver and gold and the articles of bronze and iron are sacred to the LORD and must go into his treasury." When the trumpets sounded, the people shouted, and at the sound of the trumpet, when the people gave a loud shout, the wall collapsed; so every man charged straight in, and they took the city. They devoted the city to the LORD and destroyed with the sword every living thing in it--men and women, young and old, cattle, sheep and donkeys. Joshua said to the two men who had spied out the land, "Go into the prostitute's house and bring her out and all who belong to her, in accordance with your oath to her." So the young men who had done the spying went in and brought out Rahab, her father and mother and brothers and all who belonged to her. They brought out her entire family and put them in a place outside the camp of Israel. Then they burned the whole city and everything in it, but they put the silver and gold and the articles of bronze and iron into the treasury of the Lord's house. But Joshua spared Rahab the prostitute, with her family and all who belonged to her, because she hid the men Joshua had sent as spies to Jericho--and she lives among the Israelites to this day. When she is mentioned in the Bible, Rahab is always referred to as Rahab-the-harlot. But this woman, Rahab, is mentioned as part of the genealogy of Jesus Christ as well as in the Hall of Fame of the Bible (Hebrews 11:31). This signifies to us that there was a miraculous change in Rahab's life. She has a before and after story to tell. negative connotations of her name, the Bible tells us that Rahab was a harlot; a prostitute. But God, who is the transformer of lives, touched Rahab's heart and transformed her into a brand new woman. * I know the Lord has given you the land. you when you came out of Egypt. Rahab's statement of faith clearly reveals her knowledge of God. She obviously knew who God was and what He had done for His people. She knew God was about to give them the city in which she lived. With this knowledge, Rahab was faced with some choices. And she exhibited faith by the choices she made. Her choices, and her faith, affected both her human and eternal destiny. Rahab was an amazing woman. She showed courage by standing up against her king and betraying her city knowing that God was in it. She acted boldly by choosing to save the two men who represented God's people. She showed faith by believing her country was destined for destruction and that God and his people would prevail. She showed creativity by thinking quickly, hiding the spies and sending the pursuers in another direction, and secretly helping the spies escape. She showed kindness by helping the spies escape. Rahab's remarkable story of transformation doesn't end here. 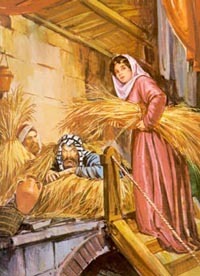 Rahab was greatly blessed. She and her family were spared during the destruction of Jericho and she lived among the children of Israel for the rest of her life. She married an Israelite named Salmon (Mathew 1:5), who tradition tells us was one of the two spies. She was the mother of Boaz...who married Ruth...who bore Obed...whose son was Jesse, the father of David...through whose line came Jesus, the Savior of the world. We may wonder why Rahab is always referred to as a harlot wherever she is mentioned in the Bible. Did God want to keep that shame ever before her? Didn't He forgive her? On the contrary. I think it is a reminder that God can cleanse even the vilest sinner. He is in the business of changing lives. He took an immoral woman and made her respectable. Rahab went from living in darkness to living in glorious light. She became part of the line that would give birth to the true Light of the world that first Christmas. Excerpt from Old Fashioned Holidays from History's Women written by Patricia Chadwick. It is available in both print and ebook formats at www.HistorysWomen.com. Stop by and pick up your copy today.